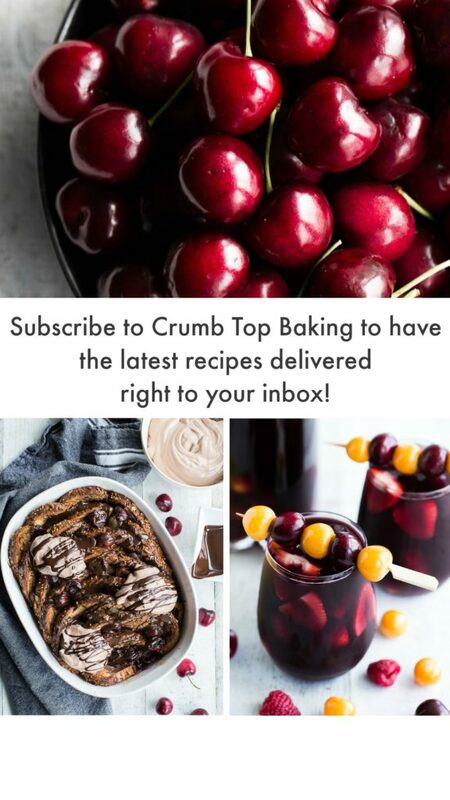 Okay, this is my last cherry recipe for a while, I promise! 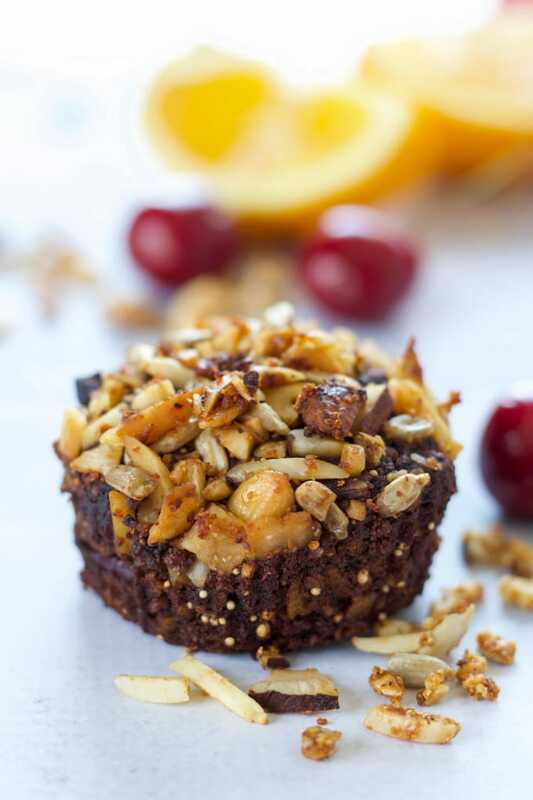 But I couldn’t let cherry season pass by without sharing this recipe for deliciously moist Orange Chocolate Cherry Muffins! With 12-grain flour and oats, these muffins make a hearty breakfast or snack. Plus, you can’t go wrong with a chocolate, orange, cherry flavour combo. Right? The cocoa creates a rich chocolate taste, which is enhanced by the hint of orange from the freshly squeezed orange juice and zest. And the fresh cherries (or the reason for this recipe 😉 ) keep the muffins moist while adding a burst of taste and texture. See, I had to share! This time of year, I love meal-prepping a bunch of on-the-go snacks and quick breakfasts. Whether it’s energy bites, muffins or a frozen pile of protein pancakes, convenience is key when the sun is shining! While I’m usually pretty good at making time for breakfast, lately I’ve been taking advantage of the early morning sunshine and enjoying a bike ride before work. That means I have a little less time for breakfast. Eek! My solution? Get up earlier? Nope. Orange Chocolate Cherry Muffins? Yup! It’s not an everyday thing, but it’s great in a pinch 😉 . 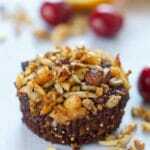 I opted not to include the icing drizzle on these Orange Chocolate Cherry Muffins, but they are topped with granola. This time it’s the grain-free granola that I used in this Coconut Banana Cherry Chip Smoothie Bowl recipe. I had a lot leftover and thought it would be the perfect topping to complement the orange chocolate flavour of these muffins. Plus, the nuts and seeds in the granola add extra protein and fibre. Another score for breakfast 😉 ! While I’ve rambled on at length about how great these muffins are for a quick breakfast, they are also perfect for a summertime road trip! So if you have some plans for this upcoming weekend, whip up a batch and throw them in your back seat. Be sure to let me know if you do, and where your road trip takes you! 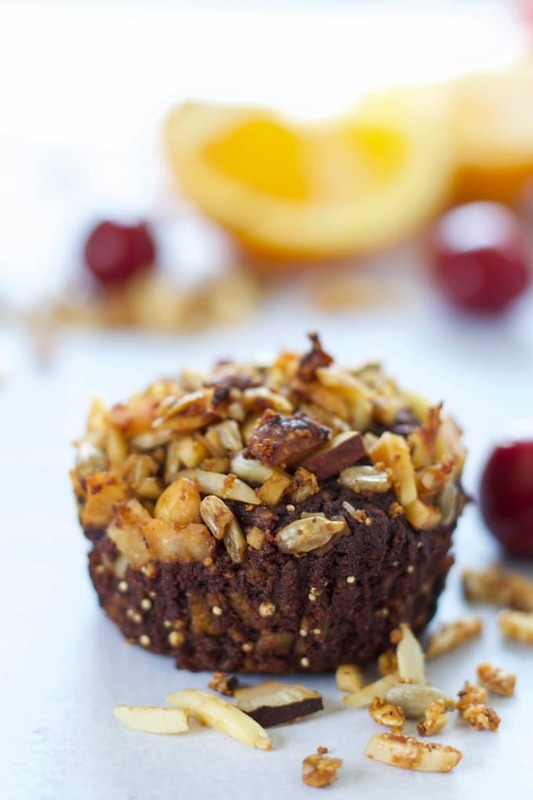 These Orange Chocolate Cherry Muffins are hearty, chocolatey and moist. And with 12-grain flour and oatmeal, these are clean eating fibre-y goodness. 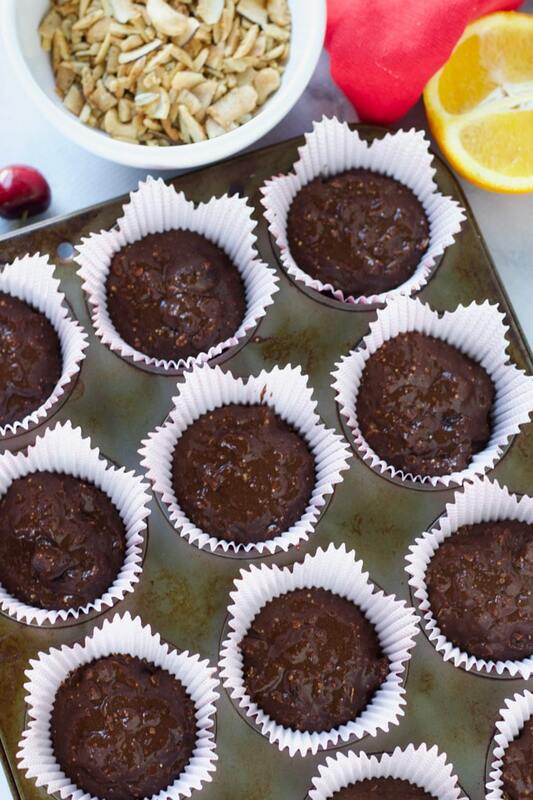 Breakfast or on-the-go snack, these muffins are perfect! And with a touch of orange, fresh cherries and cocoa, you will need to pack more than one in your lunch bag 😉 . Preheat the oven to 350 degrees and place cupcake liners in a 12-cup muffin pan. In a large bowl, add the flour, oats, coconut sugar, cocoa, baking soda and salt. Stir until well combined. In a medium-sized bowl, add the beaten egg, almond milk, olive oil, orange juice, orange zest and vanilla. Stir until well combined. Add the wet ingredients to the dry ingredients and stir to combine. No need to over mix. Fold in the cherries. 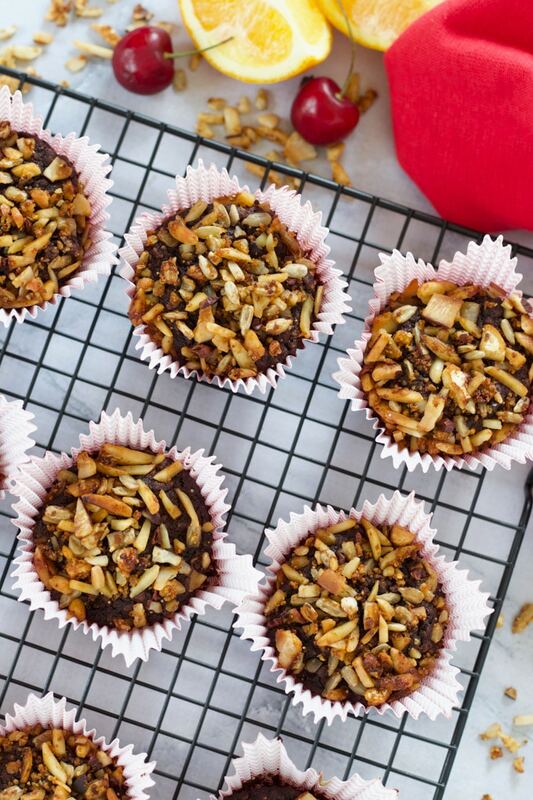 Pour batter into muffin cups and sprinkle a spoonful or two of granola on top. (I used the homemade grain-free granola from this Coconut Banana Cherry Chip Smoothie Bowl recipe). Bake for 20-22 minutes or until a tooth pick inserted in the middle of a muffin comes out clean. Let cool in the pan for 5 minutes and then move to a wire rack to cool for another 20 minutes. Store in an airtight container on the counter and enjoy within 3-4 days. If you want to freeze these muffins, I would make them without the granola topping as the granola may lose a bit of its crunch factor.